Footage on social media showed how a massive avalanche roared down the slope of Europe’s highest peak, Russia’s Mount Elbrus, burying over a dozen cars. 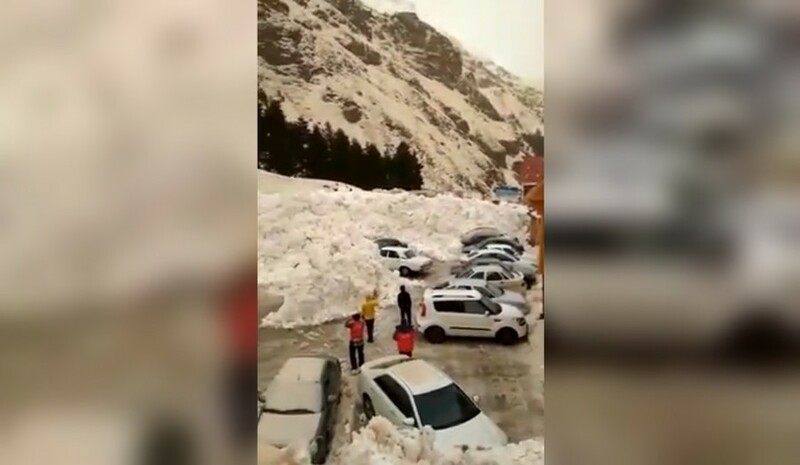 The rapid flow of snow hit the parking lot at the foot of Mount Elbrus in the North Caucasus republic of Kabardino-Balkaria on Saturday, emergency services said. Peaking at 5,642 meters, Mount Elbrus is in the top ten most prominent mountains in the world, and has some very popular ski resorts. Numerous videos released on social media show the massive avalanche coming down on the vehicles, possibly damaging them beyond repair. Luckily, the snow stopped before hitting any major infrastructure, and the emergency services said that they haven’t received any reports of people hurt. In the meantime, the yellowish color of snow is clearly seen on the slopes and on the affected parking lot. It may be the same ‘Martian’ phenomenon seen in Sochi, people on social media suggest. A mix of sand and pollen from North Africa covered the Russian Black Sea resort, leaving its mountains looking like sand dunes.